See this ad? It was in the newspaper on Sunday. No, you aren't imagining things. That's an ad for eating at Baker's Square. This is the same company that declared bankruptcy and closed almost all their restaurants in Chicagoland. This is vexing because Pam and I were among Baker's Square's most loyal customers. This is where we went about every 6 weeks to get caught up on life. We did notice that their menu changed about every 6 months and they went through a period where you couldn't get breakfast at any time of day, but the food was always reasonably good. We went for the pie. Mmmmmmmmmm pie. Oh how I miss custard pie with hot fudge sauce. Or apple pie with hot fudge sauce. Or a half slice of French silk with hot fudge sauce. Yes, there is a theme here. We had waitresses trained that when the two of us walked in, we got a back corner booth or table where we could laugh and giggle without disturbing others. My tea pot was always kept filled as was her water glass and they never batted an eye when I said, "I think I want punkin pie this time with my usual" which was a side of hot fudge sauce. 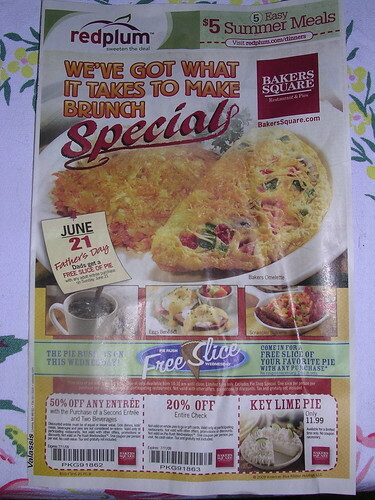 This is vexing because it toys with me, tantalizes me, says that there are still Baker's Square's in Chicagoland. I know there is one in Mount Prospect, but that's a hoof and a half to get there and, as much as I crave pie, not that much. Pam said on Wednesday when we went to IHOP for dinner (or breakfast as dinner since that's what we usually order) that the closest Baker's Square is south on Route 59 which is NOT what we want to be driving on around dinner time. Grrrrrr. Now I want pie, although not necessarily with hot fudge sauce.